Install Disk Recovery Wizard as normal, except for the following warning. To register your copy, order your personal product key with "Help" – "Order Now", or by clicking "Help" – "About" and selecting Buy Now, or by clicking "Online Order" button. 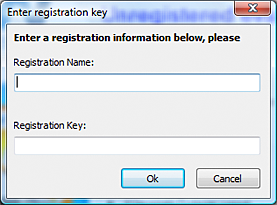 If you already have your key, use "Input Key" to enter your registration data. Click "OK" to dismiss the dialog. TIP: You can perform the complete disk scan before ordering Disk Recovery Wizard. 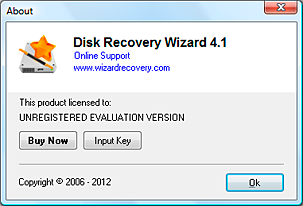 Entering a registration key is easily possible on the last step of the recovery process, immediately before Disk Recovery Wizard starts saving the recoverable files. 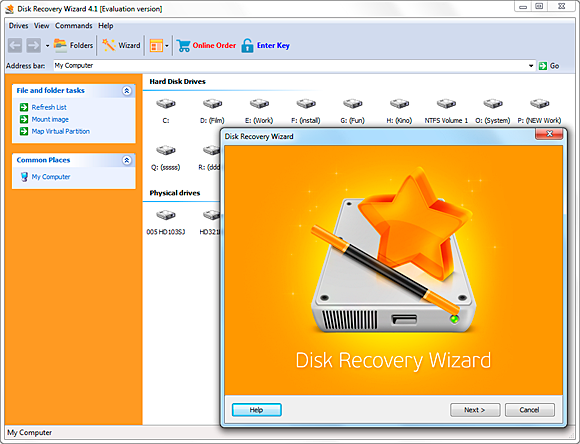 When launched, Disk Recovery Wizard displays an easy recovery wizard. 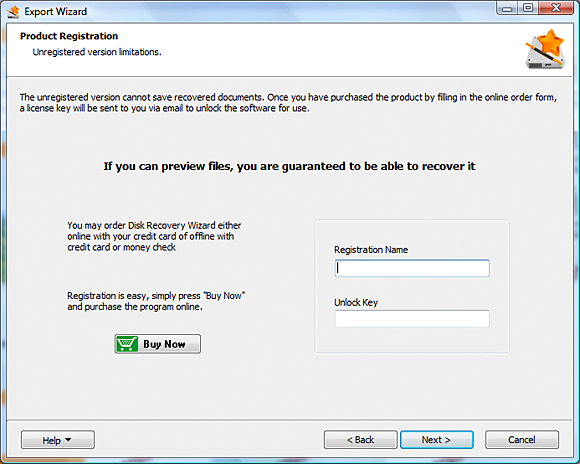 Click Next to begin the recovery, or click Cancel to access advanced features. Specify a partition or a physical drive for recovery. No changes are made to the disk during the scan, so you can safely process badly damaged or system volumes. 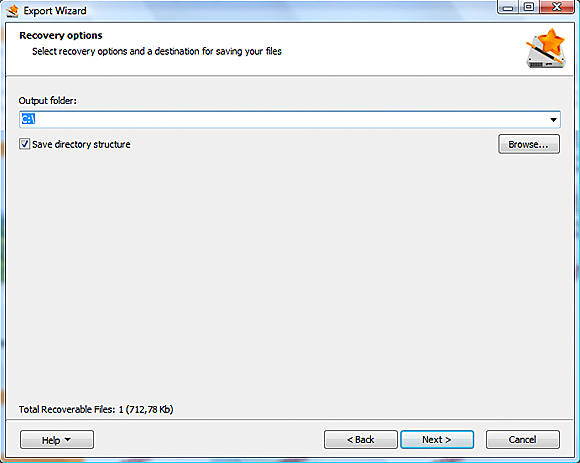 Click Map Virtual Partitions to create or make use of a virtual disk image. To mount an existing image: click Help – Mount Image. To create a new disk image: right-click on a disk or partition and select “Create Recovery Snapshot”. The following screen displays a progress bar and the number of recoverable files found so far. Large volumes might take a while to process. After the scan is complete, all recoverable files are listed in an Explorer-like window. Files and folders crossed with a red “X” are probably damaged beyond repair. Click on any recoverable file to see its preview before the recovery. 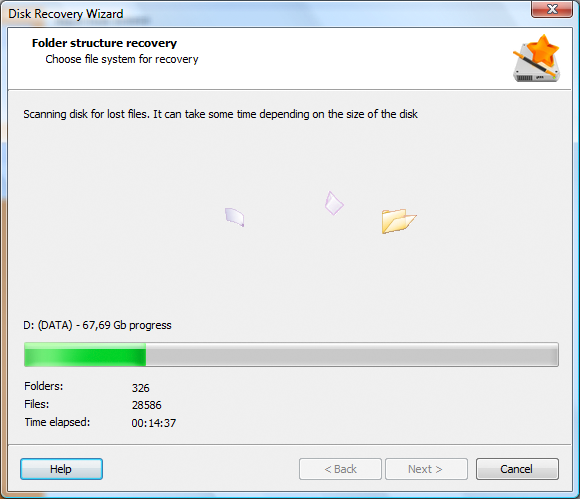 At this point, nothing gets written onto the damaged disk, so that you can safely preview as many files as you like before deciding on purchasing Disk Recovery Wizard. Check files to recover in the file tree on the left. Click Next to proceed. Select a folder to save the files to as they are being restored. If you’d like to keep the original directory structure, select the corresponding check box. Click Next to begin the recovery. 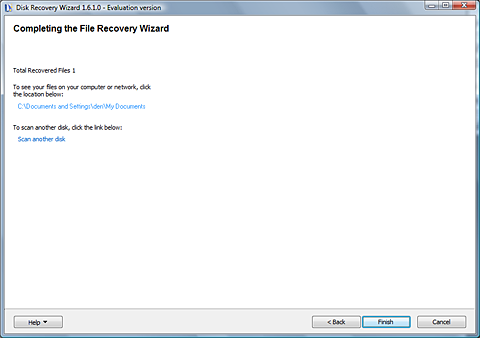 When the recovery completes, click the highlighted link to open an Explorer window with the recovered files. Click Finish. 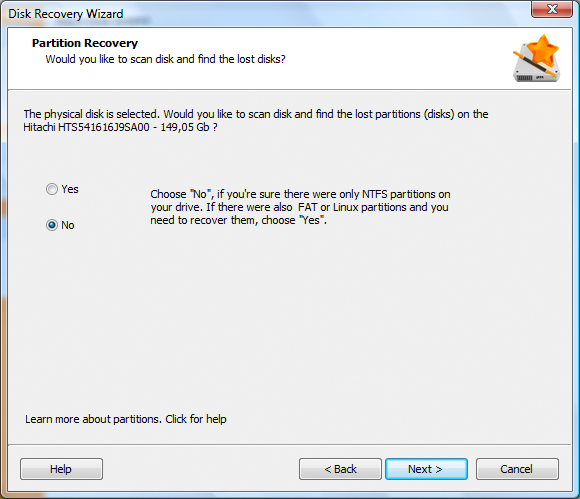 To recover corrupted partitions, select a physical disk by double-clicking on it. Selecting a physical disk will launch the discovery of deleted, lost and damaged volumes and partitions. 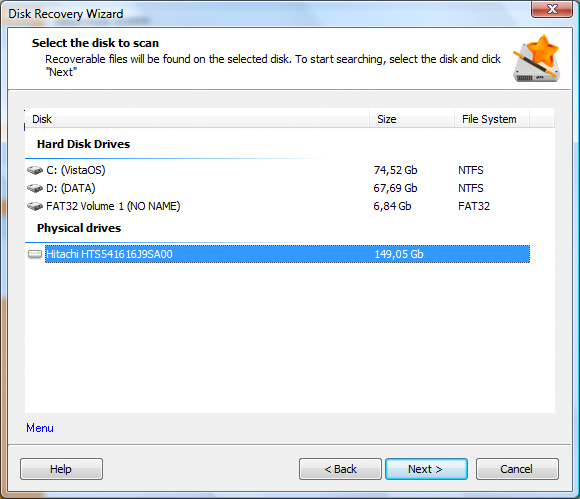 Disk Recovery Wizard will automatically scan the drive to locate all partitions, whether damaged or not, that are located on that drive. 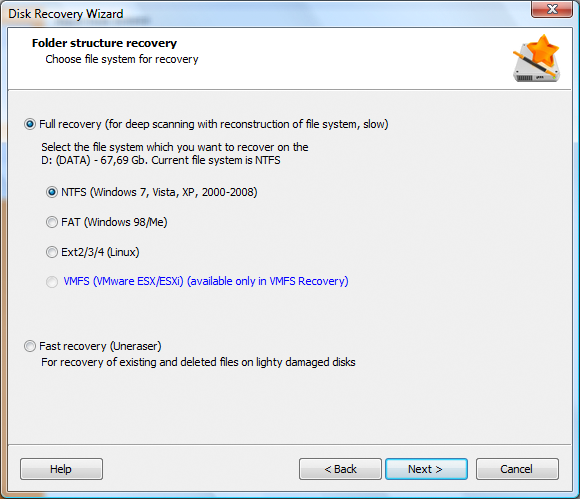 The recovery wizard will add all discovered volumes to the list of available partitions. Select a volume to recover and click Next. After that, follow the standard instructions for file recovery (see the “Searching for Deleted Data” chapter). 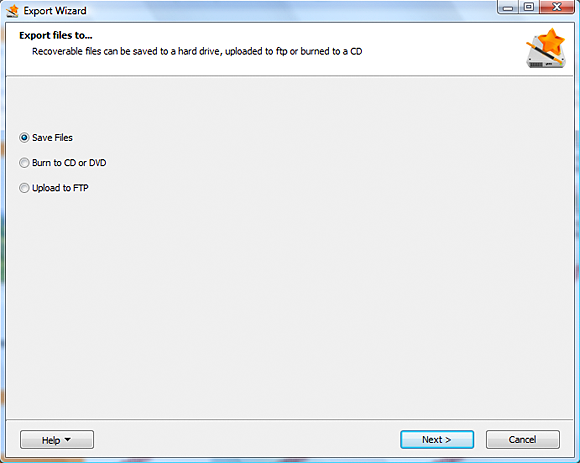 Double-click a physical disk to launch the “Recover Hard Drive” process. 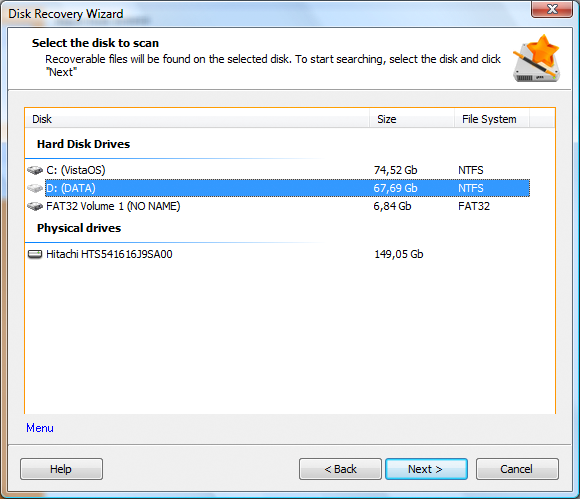 Disk Recovery Wizard will automatically scan the drive to locate data on the entire hard drive. Disk Recovery Wizard does not perform any changes to the disk at the time of scanning, so you can safely scan damaged and system volumes. Note that recovering large disks can take awhile. After the scan is finished, follow the standard instructions for file recovery (see the “Searching for Deleted Data” chapter). The “Recovered files” folder contains all recoverable files discovered by SmartSearch. 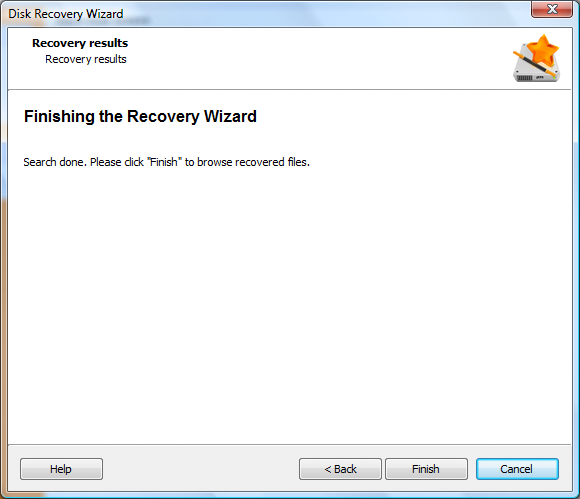 SmartSearch is an innovative proprietary recovery technology invented by WizardRecovery Company. The SmartSearch technology scans your file system to learn about the files that were simply deleted, and then scans the hard drive directly in order to locate files that are no longer reflected in the file system. The two-pass scanning yields the best possible outcome in recovering files from severely damaged disks and partitions. SmartSearch is able to detect the beginning and end by each recoverable file by using a list of file signatures, supporting over a 230 different types of files. The recoverable files in the “Recovered Files” folder are grouped by the type. 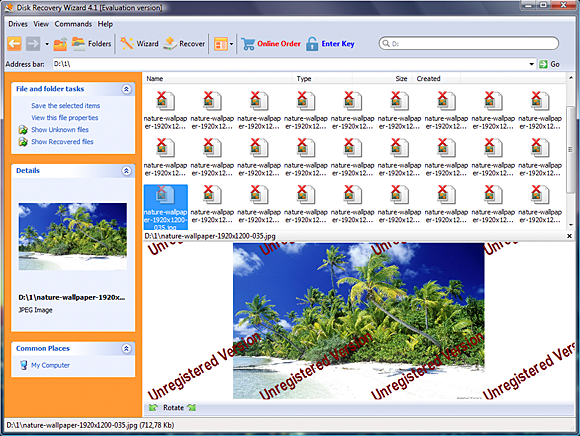 Each sub-folder represents a particular types of files located by SmartSearch. 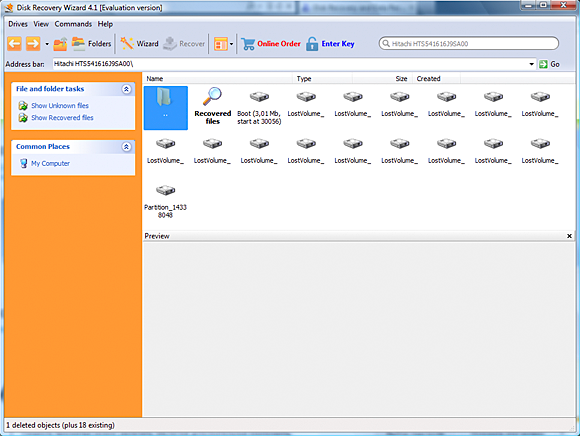 Enter a folder and click on a file to see a full-size preview (the feature works in both free and registered editions of Disk Recovery Wizard). Disk Recovery Wizard can preview a number of file types such as image files, MS Office Documents, Video Files, Music Files, Archives, HTML files, Address book (wad), MSG and EML files, and Text files. Simply pick a file and see a preview displayed on the top part of the window. 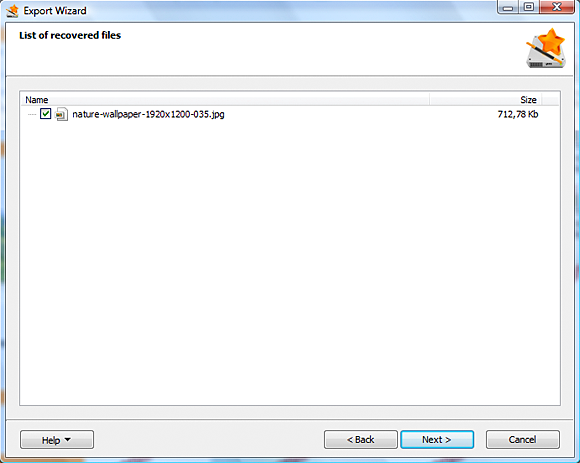 In order to recover all files of a certain type, mark the corresponding Recovery Folder in the file tree on the right. For example, you can recover all Microsoft Word documents, mark the “Microsoft Office Word Document” folder. Similarly, to recover folders or separate files, mark them in the file tree. Click Next to recover selected files and folder.